We are betrothed in providing a wide series of Capacitors, which is made by professionals utilizing the top quality component and advanced technology. In this type of application capacitor duty contactor or power contactor are used to switch ON the capacitors as per the system is achieve power factor. 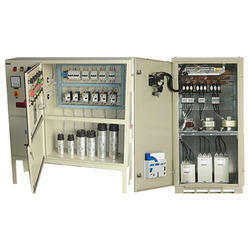 We are actively engaged in offering an optimum quality Capacitor Panel. The offered range of panel is manufactured using high grade raw material and latest technology in conformance with set universal standards. DMV Projects & Engineering (P) Ltd.
We are instrumental in offering a wide gamut of Capacitor Control Panels to the customers. These are tested on several parameters to ensure an uninterrupted performance. Our panels can stop the direct current and allow alternative current to flow through. Further, these are widely used for various industrial applications. Automatic Power Factor correction Panels with manual override to maintain the Power factor in the desired range. Design facilitates easy connection, ample space for Capacitors, efficient heat dissipation, Protection against re-energisation of Capacitor Bank before it is fully discharged.